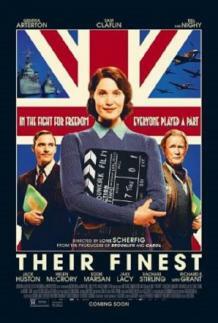 Their Finest, set in London in 1940 during the height of the Blitz, takes its title from a speech by Winston Churchill. It is a film about filmmaking, in particular the making of a film to serve as a salve for the besieged British populace. It features a plucky, proto-feminist heroine, a jaded love interest, a raft of distinguished English character actors, and an adorable dog. When boiled down to elevator pitches, Their Finest sounds like a winning round of Oscar-bait bingo. Happily, it is nothing of the sort. It is a charming romantic comedy that sees director Lone Scherfig expand on the sensibilities she displayed with Italian For Beginners and An Education. Aiming for a target somewhere between Howard Hawks and Richard Curtis, Their Finest is a crowd-pleaser, showcasing surprising performances from Gemma Arterton and Sam Claflin, and an entirely unsurprising one from Bill Nighy – a master scene-stealer pulling off yet another brazen heist. A Welsh girl living in London, Catrin (Arterton) thinks she’s applying for a secretarial position when she walks into the British Ministry of Information’s film division. But when her supervisor (Richard E. Grant) learns that she has experience as a copywriter, he hires her to write ‘slop’ – an old screenwriter’s code for dialogue between women – for the propaganda shorts that run between features at cinemas. Though the work is deadening, Catrin needs the money, with her painter husband (Jack Huston) failing to bring in much income. One day, she’s dispatched to the coast to interview twin sisters who helped ferry soldiers home during the evacuation of Dunkirk, to see if their story might be fodder for a film. Once there, she finds a dead end – the twins’ heroic tale was profoundly exaggerated – but decides to pitch an idealized version of their ordeal anyway. On a directive to make movies that contain ‘authenticity informed by optimism,’ the Ministry greenlights the Dunkirk film, and assigns Catrin to help write it. Initially spurned by her male colleagues, Catrin gradually learns how to get along in the smoke-and-booze-filled writers room; begins asserting herself against the condescension of her writing partner Buckley (Claflin); and stops objecting when the script drifts further and further from her already-fictionalized take on the Dunkirk rescue. Once the film gets ready for casting, we’re introduced to Ambrose Hilliard (Nighy), a deluded, narcissistic actor gone to seed. In need of work, he begrudgingly agrees to take an embarrassing role in Catrin’s film – as a disheveled drunk uncle – all the while pestering her for rewrites. When they travel to shoot on location, Catrin and Buckley’s bickering relationship starts to deepen, their flirtations all the more interesting for being grounded around work. Arterton tackles her role as Rosalind Russell-turned-Rosie the Riveter, coming alive as she gradually forces Buckley to regard her as an intellectual equal, while Claflin translates the insinuating arrogance of his Hunger Games role into tetchy, neurotic sarcasm with admirable success. Screenwriter Gaby Chiappe does deft work to balance the farcical film biz misadventures with the simmering unease of rationing and air-raids. And director Scherfig’s tonal instincts are spot-on: her depiction of wartime London (achieved with the help of a mostly-female below-the-line crew) strikes a believable balance between grit and rose-tinted nostalgia. 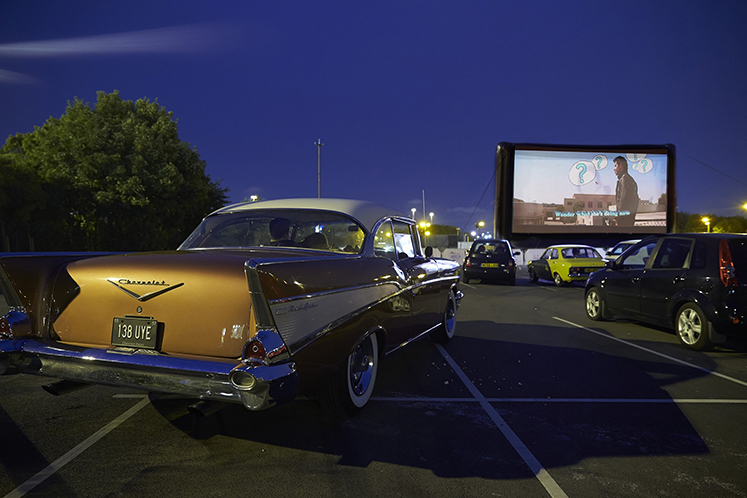 The film is broad and rib-nudging when it wants to be, understated and dignified when it needs to be. Even when it takes a turn for the tragic, Their Finest never loses its buttoned-down good humour.